Are you looking for some reviews about the best above ground pools? Nothing beats hanging out and chilling in a pool with your friends and family. It’s a great way to pass time, especially during unusually hot days and even on days when it’s quite chilly. But everyone knows that it can be quite expensive to have a pool built and it would take up a lot of space too. Below you'll find some cheaper or more affordable options to consider. Think of it like a beneficial addition to your home like a tankless water heater. Above-ground pools are great for people who don’t quite want to make the commitment of getting a typical underground pool. These above-ground pools are worth checking out if you’re thinking about getting one for your home. You might just be able to find the right pool for you here. 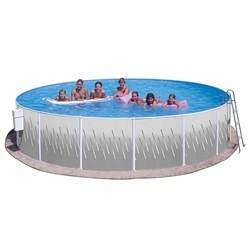 The Intex Round Frame pool comes in three different sizes to suit different households. You can get one that is 12 feet by 30 inches, 15 feet by 48 inches, or 24 feet by 52 inches. Intex is very proud of the metal frames of their pools which are very sturdy. Their liners are also very tough to match the frames. Assembling this pool is very easy and should take less than an hour to do. It also comes with a filter pump to use with the pool and if assembly gets too confusing, there is also a DVD that comes with the product. This pool is easy to assemble that even kids would be able to figure it out (with adult supervision of course) which is why it has an average Amazon rating of 4 stars. This is another pool from Intex but this one is a rectangular pool, reminiscent of must in-ground pools. The shape makes it a good pool for doing laps or just having fun playing pool games. 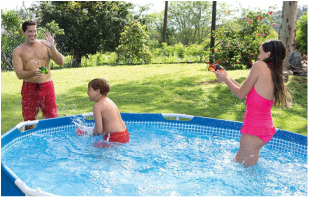 The Intex Rectangular pool even comes with a volleyball set that you can enjoy with you family and friends. It has rust-resistant metal beams to make sure that this pool will last you years without bothering you. This is a fairly large pool and would be great for entertaining people or just having fun with your family. 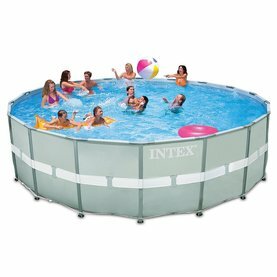 This round above ground pool comes in several sizes for you to choose from; 18 ft by 52 inches, 24 ft by 52 inches, and 27 feet by 52 inches. 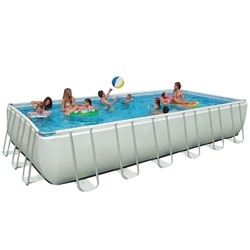 It is made out of steel and also has parts made out of resin which makes it a sturdy pool. It comes with a step-by-step installation video to guide you through the process so that you can start using your pool as soon as possible. It also comes with a 1 horsepower pump and motor for you to use with your pool. There are a lot of things to consider when you are getting an above-ground pool. The first would, of course, be the size of the pool that you are going to get. You have to make sure that your pool will fit in the space that you’re planning on placing it in. You also need to decide if you want a collapsible pool or a permanent one, taking the maintenance into consideration. While getting a permanent pool seems easier, you have to remember that you would have to do year-round maintenance. This makes collapsible pools seem more enticing but you need to remember that you have to store it properly to ensure that it will be in great shape any time that you might need it. You also have to remember that it is essential for you to place your above ground pool on a level surface to ensure that it will give you the best experience you can expect from it.